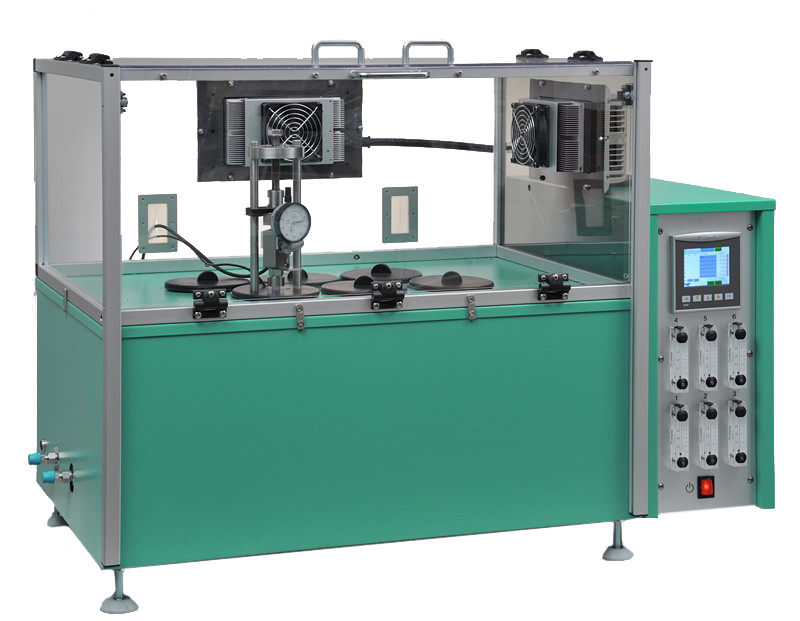 Stress Relaxation Tester - EB 02 Relaxation system for continuous measurement in either compression or tension. 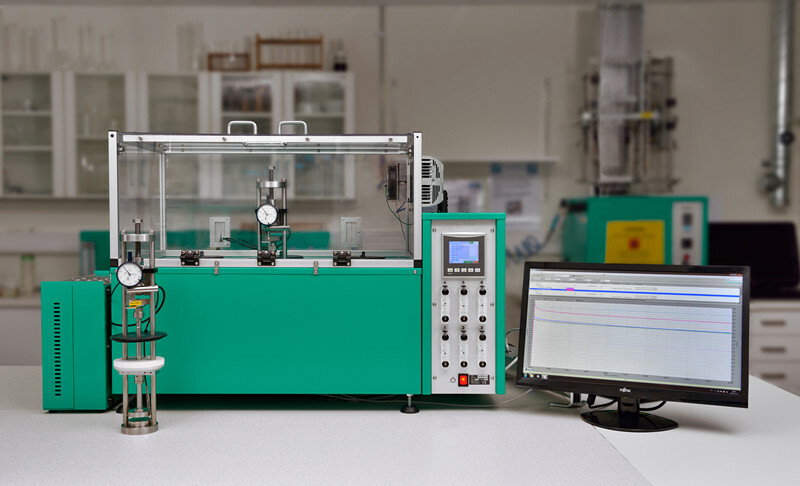 The Stress Relaxation Tester - EB 02 meets the requirements in ISO 3384, ISO 6914 and ASTM D6147. The relaxation rigs are used in combination with the cell ageing ovens our new range of ovens when testing at elevated temperature. New Cell Ovens for Stress Relaxation We have now constructed special versions for use in relaxation testing. The height of these ovens is lower and incorporates an integrated draught hood (The Draught Hood is used to eliminate variations in force measurements due to temperature and air effects in the surrounding environment.) to eliminate variation in force measurements due to temperature and air effects. 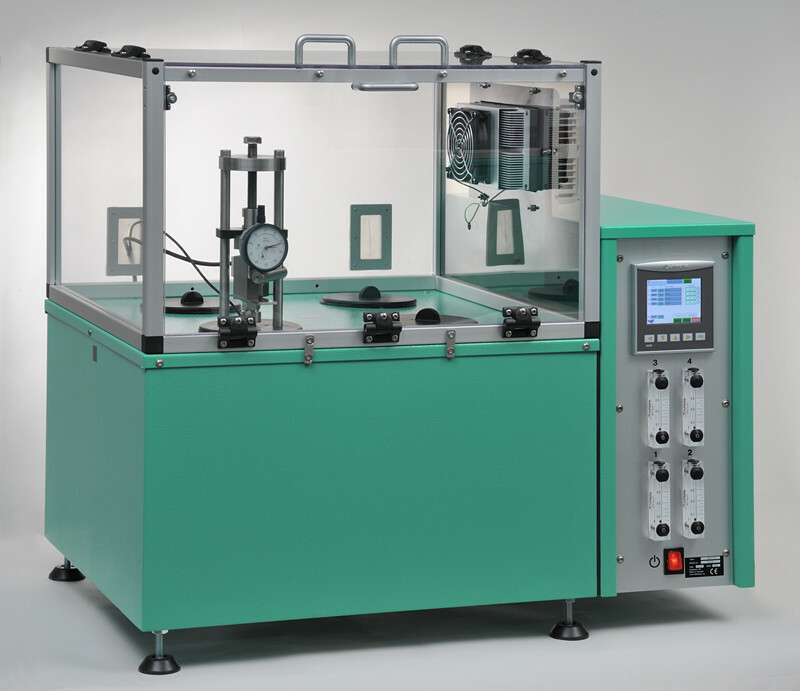 Relaxation tests are becoming more and more popular for determination of rubber properties. From the beginning stress relaxation tests were used mainly in scientific projects at universities, but a growing use has been shown in recent years. This may be caused by the introduction of stress relaxation tests in product standards, such as sealing rings for pipes. The automotive industry has also started to specify stress relaxation tests for critical sealing products in the cars. The present standard ISO 3384-1 includes two methods, A and B, which can both be used in air or liquids. In method A, the compression is applied and all counter force measurements are made at the test temperature. 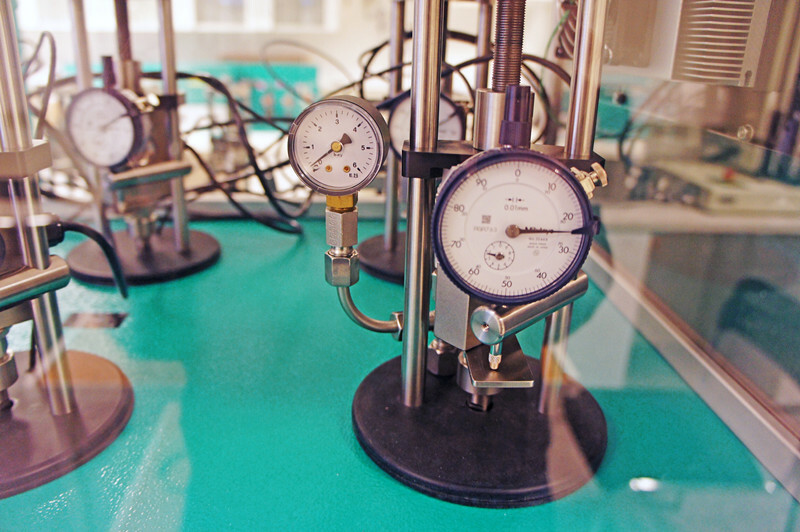 In method B, the compression is applied and all counter force measurements are made at standard laboratory temperature (23 °C). The test pieces are stored at the test temperature. ISO 3384-2 is a new second part describing tests with temperature cycling. ISO 6914 describes the testing of stress relaxation in tension. This can be done by two methods, either on continuously stretched samples or intermittently stretched samples. One type of relaxation instrument is measures continuously and consists of a small rig with a load cell. As temperature stability is a critical parameter, special ovens are available for testing at both elevated and ambient temperatures. The rigs are connected to a data acquisition box connected to a computer for storing the force and temperature data. Relaxation system for continuous measurement in either compression or tension meets the requirements in ISO 3384, ISO 6914 and ASTM D6147. The relaxation rigs are used in combination with our cell ageing ovens. The ovens perform well inside the apparatus requirements in ISO 188, IEC 811 and other equivalent standards. The oven is controlled from a PLC (with a colour touch screen). Special design with controlled air exchange rate and low air speed. The inner cells are made of aluminum. Temperature controller with 0.1°C setpoint (PLC) or liquid circulator EB 17. Flowmeters with needle valves, for setting the air exchange rate. The air speed is low and is dependent on the air exchange rate only, as specified in ISO 188 method A and IEC 811. Alarm for low air pressure (PLC). Cooling channels in the casing for low surface temperature. Indication of power failure (PLC). Individual cell identifier "Test name". Microfilter for the air which removes 99.99 % of all particles over 0.1 μm. Data from relaxation tests done at three temperatures are plotted in a graph and the "end of life" is determined for each temperature. This data is then plotted in an Arrhenius graph with ln time against 1/T, where T is the temperature in Kelvin. A linear extrapolation can be done for lower temperatures to establish the estimated life time of the tested compound. The Equipment works with continuous stress relaxation measurements in both compression and tension. The basic version can do tests according to ISO 3384 and ASTM D6147. The rig works together with the new generation cell ovens EB 21, EB 22, EB 23 and the programmable temperature cell oven EB 17 and EB23LTP. EB 02.01 Container and pressure plate (with a hole in the centre) for measurement in liquids, according to ISO 3384. EB 02.08 Room Temperature Box, 23 °C, for testing at standard laboratory temperature. Keeps the temperature constant within ±0.2 °C. The box can take 8 rigs. EB 02.14-1 Amplifier box with inputs for 1 load cell and 1 Pt 100 sensor (1 rig). EB 02.14-2 Amplifier box with inputs for 2 load cells and 2 Pt100 sensors (2 rigs). EB 02.14-4 Amplifier box with inputs for 4 load cells and 4 Pt 100 sensors (4 rigs). EB 02.14-6 Amplifier box with inputs for 6 load cells and 6 Pt 100 sensors (6 rigs). EB 02.14-8 Amplifier box with inputs for 8 load cells and 8 Pt 100 sensors (8 rigs). EB 02.14-12 Amplifier box with inputs for 12 load cells and 12 Pt 100 sensors (12 rigs). EC 05 This software evaluates results from relaxation tests according to ISO 3384 (compression) and ISO 6914 (tension). NOTE: Our stress relaxation rigs are also available in acid proof steel.